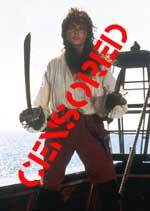 Renny Harlin's rum box office flop Cutthroat Island is a guilty pleasure for many film fans, who will be thrilled to hear that a new DVD version is to be released on December the 1st by Momentum Pictures. The new version will have a commentary track (by Harlin); Making of... and Behind The Scenes featurettes; interviews with Harlin and stars Geena Davis, Matthew Modine and Frank Langella; storyboards and a trailer. The disc will also boast an anamorphic transfer (the Region 1 version is widescreen, but not anamorphic), and Dolby Digital 5.1 audio. RRP will be £12.99. Momentum have confirmed that the new DVD will feature the same BBFC-censored version of the film (cut by more than a minute) that features on the current VHS release. Momentum were forced to cut the DVD version to match the tape because BBFC regulations do not allow for two versions of a film to be available simultaneously (except in the case of films clearly labeled as "Director's Cut", or something similar). The Region 1 version is, of course, uncut. 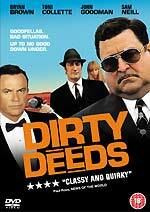 The Australian organised crime comedy Dirty Deeds, which stars John Goodman, Bryan Brown and Sam Neill, is being released by Momentum Pictures on January 26th, with an RRP of £17.99. The disc will contain three commentary tracks (one by Writer / Director David Caeser, another by Director of Photography Geoffrey Hall and a third by music composer Paul Healy), a behind the scenes featurette, Get Dirty, a Behind The Music featurette, outtakes and a photo' gallery. Technical spec's have not been released, but it should be a 2.35:1 anamorphic transfer. 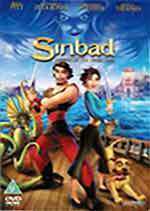 With a bit of luck and a fair wind Dreamworks' high seas animated adventure Sinbad - Legend of the Seven Seas will get a bit of a boost in the wake of the enormous success of Pirates of the Caribbean. The film, which features the vocal talents of Brad Pitt, Catherine Zeta-Jones, Michelle Pfeiffer and Joseph Fiennes, will be released on DVD on November the 17th, with an RRP of £19.99. 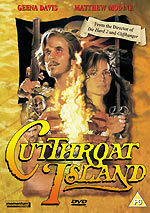 The disc will feature a treasure trove of bonus material, including a commentary track by directors Patrick Gilmore, Tim Johnson and other filmmakers, Cyclops Island (an interactive adventure featuring a choice of five characters, 6m), a Making of... documentary (11m), a featurette about Sinbad's dog, Spike (3m), an art gallery, 50Mb of DVD-Rom games (including printable books and masks), and three set top games. The disc will also feature a teaser trailer for Mike Myers' movie version of Dr. Seuss' Cat In The Hat. The disc will have DTS and Dolby Digital 5.1 sound options, and will be presented in anamorphic 1.85:1 ratio. Universal Playback continue to thwart fans of American Gothic with four new TV releases, which will be released on November the 24th, each with an RRP of £17.99. The Best of Knight Rider is a two-disc set that contains six episodes (four of which are being made on DVD for the first time - which beggars the question why re-release the other two?) The episodes are Trust Doesn't Rust, Knight of the Phoenix parts one and two, Soul Survivor, Knightmares and A Good Knight's Work. 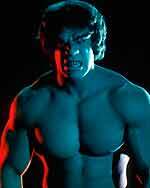 Two separate volumes of The Incredible Hulk "revealing how the legend began" will also be released on November the 24th. Make as much sense of this as you can: there are "three episodes on each release plus two new episodes to DVD on Volume 1 and three new episodes to DVD on Volume 2". That seems to indicate that the two discs will contain eight episodes in total. Star Trek V - The Final Frontier will be released by Paramount on December the 22nd as a two-disc set containing more than five hours of bonus materials. The set, which has an RRP of £24.99, features a commentary track by William Shatner, who both starred in the film and directed it, featurettes (including a behind the scenes documentary featuring Leonard Nimoy, Scenic Artist Michael Okuda and executive Producer Ralph Winter), deleted scenes and exclusive interviews. The disc also contains a hidden gag reel, featuring Winter, Producer Harve Bennett and Screenwriter David Loughery interacting with one of the scenes from the film. Other imminent Star Trek releases include the impressive Borg Mega Cube (which contains the complete Star Trek - The Next Generation, in a limited edition of a thousand copies, with an RRP of £449), on November the 3rd. Star Trek - Deep Space Nine Season 6 is due on December the 1st, and, Deep Space Nine Season 7 is released on the 22nd of December, completing the series.